The Oase Aquamax Eco Classic Pump has a high performance motor and are capable of pumping coarse debris up to 8 mm in size. All Aquamax Eco Classic pumps have a 1 1/2" connection thread on the outlet side and 1 1/2" connection thread on the inlet side with hose connecting pieces for hoses ranging from 1" to 1 1/2" inches and a cable length of 10 m. The full guarantee of 3 years can be extended by 2 additional years to 5 years. In addition the pumps are suitable for use in swimponds and bathing ponds. Including special hose adapter with threaded collar for connecting hose sizes 3/4", 1", 1 1/4" and 1 1/2". 3 + 2 year guarantee. The main difference between the Aquamax and the other pumps is its particularly specially designed impeller. Due to the two large blades of the impeller, even highly polluted water can be transported efficiently (this means the fish and other waste). Outlet size 1" 1.5" 1.5" 1.5" 1.5" 1.5"
Suction Size 25mm 1.5" 1.5" 1.5" 1.5" 1.5"
The new Original, like always, just better. The Oase AquaMax Eco Premium, all-new design, more energy-saving and new engine technology! The Aquamax Eco Premium once again has reduced energy consumption, the range starts with the 4000 at 40 watts going up to the 16000 model at a mere 145 watts. Running these premium filter pumps won't break the bank, combine that with a five year guarantee and you really can't fail with the Aquamax Eco Premium range. This is the new original, still made in Germany. Oase Aquamax Eco Premium pond pumps are Oase's latest pump. The Oase Aquamax Premium features 25% lower running costs than the Oase Aquamax Eco. The Oase Aquamax Premium will be available January 2012. Supplemental, patented connection of optional filter accessories for dirt feeding of further pond zones. On the Aquamax Eco Premium 12000 and 16000 there is a seasonal flow control, this allows the pump to adapt to its environment. When you have the seasonal flow control switch turned on, your filter pump will automatically change its flow with the pond temperature. So in the cooler months, the pump reduces the flow by 50% this stops unnecessary water contact with the cold winter air and will also help to reduce running costs by up to 30%. If you have a skimmer or satellite strainer attached to the pump or a high head height, it is best to turn the seasonal flow control switch off as the reduced flow rates will not allow the pump to use a skimmer or go to it's maximum head height. The sleek new cage design with a new grille system has helped the Aquamax Eco Premium increase its surface area by 5% and it will now accept solids up to 11 mm, making it a very effective filter pump indeed. The cage design has also been made easier to use, the old style push in clips have been replaced with two new flip up style briefcase clips, these will make opening and cleaning your filter pump a doddle. The secondary inlet that allows the attachment of either a satellite strainer (this can be positioned in an area of the pond which doesn't get as much water flow or on a shelf) or a skimmer (to help reduce surface debris such as leaves, twigs, pollen and dust) has a new and improved design. The concept of the settings remains the same, set the unit at 0 and you will draw 0% from the secondary inlet, set at number 1 - 25%, number 2 - 50%, number 3 75% and number 4 - 100%. This control use to be a little tricky to set in place and move back or forward, not anymore, it now slides with ease! During the start up process of the Oase Aquamax Eco Premium there are some clever features that can often go unrecognised in these great pumps. The pump actually for the first 2-3 minutes undergoes a pre-programmed self test, this runs the pump through various different speeds and detects whether water is running through the pump correctly. If the pump does happen to run dry with no water going through it, the unit will then automatically switch itself off, the pump will automatically make new attempts to restart itself. These Oase Aquamax Expert pumps are top class filtration and watercourse pumps they will get any amount of water moving. Either for designing impressive watercourses and waterfalls for new, exclusive garden landscapes, or for powerful displacement of pond water to the filtration system. Oase Aquamax Expert will cope with Coarse debris particles up to 8 mm in size. Enormous stability and a handle that is aligned to the Oase Aquamax Expert pump's centre of gravity. The Oase Aquamax Expert is fully capable of over wintering, even if the pond completely freezes over. 1 ", 1.5 ", 2 ". The Oase AquaMax Eco Expert 21000 are the next generation of the powerhouses, energy-efficient for rigorous requirements, the AquaMax Eco Expert 21000 is energy-efficient pump delivering an extremely powerful and economic capacity. Perfect for use in demanding filter systems or for large watercourses and waterfalls. The Oase AquaMax Eco Expert 21000 has excellent efficiency and at the same time outstanding displacement of coarse debris down to 11 mm in size. The Oase AquaMax Eco Expert 21000 is robust and comes complete with a durable stainless steel housing for stability. Furthermore, the Oase AquaMax Eco Expert features dry run and blocking protection through the EFC (Environmental Function Control), switching itself off to prevent damage if a dry run scenario arises. For ultimate control, the new OASE FM Master WLAN Smart Controller can be used to connect the Oase AquaMax Eco Expert Pump via DMX, allowing flow control via a smart phone or tablet using WiFi signal. Alternatively, the new Aquamax Eco Controller can be connected via the DMX cable port at the rear of the pump, for cost effective digital control of the pump performance. The Oase AquaMax Eco Expert 26000 are the next generation of the powerhouses, energy-efficient for rigorous requirements, the AquaMax Eco Expert 26000 is energy-efficient pump delivering an extremely powerful and economic capacity. Perfect for use in demanding filter systems or for large watercourses and waterfalls. The Oase AquaMax Eco Expert 26000 has excellent efficiency and at the same time outstanding displacement of coarse debris down to 11 mm in size. The Oase AquaMax Eco Expert 26000 is robust and comes complete with a durable stainless steel housing for stability. The Oase AquaMax Eco Expert 36000 are the next generation of the powerhouses, energy-efficient for rigorous requirements, the AquaMax Eco Expert 36000 is energy-efficient pump delivering an extremely powerful and economic capacity. Perfect for use in demanding filter systems or for large watercourses and waterfalls. The Oase AquaMax Eco Expert 36000 has excellent efficiency and at the same time outstanding displacement of coarse debris down to 11 mm in size. 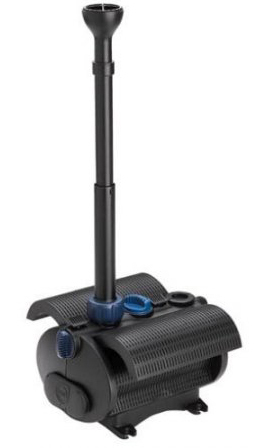 The Oase AquaMax Eco Expert 36000 is robust and comes complete with a durable stainless steel housing for stability. The Oase AquaMax Eco Expert 44000 are the next generation of the powerhouses, energy-efficient for rigorous requirements, the AquaMax Eco Expert 44000 is energy-efficient pump delivering an extremely powerful and economic capacity. Perfect for use in demanding filter systems or for large watercourses and waterfalls. The Oase AquaMax Eco Expert 44000 has excellent efficiency and at the same time outstanding displacement of coarse debris down to 11 mm in size. The Oase AquaMax Eco Expert 44000 is robust and comes complete with a durable stainless steel housing for stability. The OASE Aquamax Eco Control is designed for connection to the Aquamax Eco Expert 21000 & Eco Expert 26000 pumps. This innovative controller will not only allow electronic adjustment of the pumped water flow, but will also provide feedback as to how the pump is performing and report potential malfunctions. The weatherproof device is supplied with a 10 metres (33ft) of special DMX-RDM cable which features a IP68 rated terminal for underwater connection to the Expert Eco pump. The digital display is powered and illuminated by the pump itself, so there is no extra requirement for electrical connection to power the controller. The Aquamax Eco Control can be used to electronically reduce or increase the water flow making this ideal for larger ponds with filter systems, as less flow is required during the winter months than in the summer. As the flow is electronically reduced, this will also save on energy consumption. Flow adjustment is also very effective on larger waterfalls and streams, allowing the user to adjust the water display to suit their mood. The DMX/RDM Connection cables are designed for connection between the Oase Aquamax Eco Titanium 50000 Pump, Aquamax Eco Expert 21000 & 26000 Pumps and the Oase FM Master WLAN Smartphone Controller. The special terminals are designed for underwater use and allow two-way communication between the pump and Oase WLAN controller. The cables can also be used to loop together multiple pumps for communication and control via the single WLAN controller. The Oase DMX-RDM Connection Cables are available in 1m, 3m, 5m, 10m & 20m lengths. The Oase Aquamax Gravity Eco Pump range are without doubt the most efficient and frugal pumps on the market today and are fantastically cheap to run. With all new electronically controlled electric motors and clever impellor design, nothing comes even close in terms of providing efficiency in terms of moving water. Unique, economical gravity filter pump, optimal for use in koi ponds and swimming ponds. Energy efficient pump with increased flow capacity. A new hydraulic concept ensures high circulation volumes. Oase Aquamax Gravity Eco pumps have been developed to optimally meet the requirements placed on filtration pumps for koi ponds with Integrated dry-run protection. The Oase Aquamax Gravity Eco pumps are a economic gravitation filter pump. Very low wattage, Can be dry mounted. Has integrated, intelligent dry run protection “GSR” (Gravity-Self- Regulator).Support foot is removable. New hydraulic servo technology motor. These Oase Aquamax Gravity Eco pumps come with a 3 year warranty which can be extended to 5 years simply by returning the warranty card to Oase. Ideal pump for Nexus Eazy 200 or Nexus Eazy 300 Filters. The Oase Aquamax Twin 20000 Pond Pump is now available from Absolute Koi . The Oase Aquamax Twin 20000 Pump is the direct replacement for the Oase Promax 20000 Pond Pump for which its high performance and reliability was well know throughout the years it reigned. The new high performance Oase Aquamax Twin 20000 pumps are designed for filter systems, watercourses, waterfalls and in gereral moving large quantites of water at very economical costs. The Oase Aquamax Twin 20000 have two seperate motors that can be individually switched on or off, or dimmed via wireless remote control, with digital display of the respective power level. Powerful filter pump with 2 motors, individually adjustable by remote control. Reduced power consumption and effective control of the flow rate. Minimal maintenance requirements thanks to large wrap-around Strainer. Patented damper mechanism guarantees optimal flow rate. Solids handling of particles up to 11mm in size. In addition to pond floor filtration, simultaneous connection of a Satellite filter or Skimmer is also possible. The Oase Aquamax Eco Twin will not be damaged due to temperatures as low as -20c, guaranteed. Comes complete with Environmental Function Control (EFC by Oase) protects against dry-run and blocking. The Oase Aquamax Eco Twin are also suitable for use in Swim Ponds and Bathing Ponds when inserted in an exterior pump chamber and are suitable for continual use. Depending on the debris input in the pond, you can decide from which point the water should be delivered into the filter. You can dim or switch off the pond floor filtration by remote control, and concentrate only on the surface or pond edge. Thus, you can use the pump totally effectively. The Oase Aquamax Twin 30000 Pond Pump is now available from Absolute Koi . The Oase Aquamax Twin 30000 Pump is the direct replacement for the Oase Promax 30000 Pond Pump for which its high performance and reliability was well know throughout the years it reigned. The new high performance Oase Aquamax Twin 30000 pumps are designed for filter systems, watercourses, waterfalls and in gereral moving large quantites of water at very economical costs. The Oase Aquamax Twin 30000 have two seperate motors that can be individually switched on or off, or dimmed via wireless remote control, with digital display of the respective power level. Oase Aquarius Universal Pro (Formerly Oase Profinaut) Pond Pumps are high-performance pumps that are excellent for use in fountains. They are more powerful than the Aquarius Universal Eco and boast flow rates of up to 40,000 litres per hour. The Aquarius Universal range are perfect for waterfalls, bubbling stones and large decorative fountains. They are quiet running and easy to adjust. The more powerful pumps starting with the Aquarius Universal 3000 model have a removable pedestal to enable installation even where space is extremely limited. In addition these pumps also have a stainless steel filter basket which guarantees the long service life and an ergonomic handle for easy installation and transportation. The pumps are completely capable of withstanding winter conditions so that they can stay in the water throughout the entire year. They can be set-up outside of the water, below water level (both the indoor and the outdoor version). Regardless of the application, all pumps can be controlled individually and conveniently. The Aquarius Universal Pro comes with an adapter set for connection of one inch and one and a half inch nozzles. Oase Aquarius Universal (Formerly Oase Neptun) Pond Pumps are high-performance pumps with compact dimensions, making them excellent for use in fountains and other water features. The Oase Aquarius Universal Range of environmentally friendly pumps are great for water features including waterfalls, statues and even larger decorative fountains, each pump is frost resistant to a temperature of -20⁰C. The Oase Aquarius Universal pumps have 11 adjustable models in the range, there is sure to be the right one for your pond, whatever the size. The larger models of the the Oase Aquarius Universal pond pumps, from the 3000 upwards, feature a removable pedestal to make installation easier, even in the smallest space. Each pump sits in stainless steel filter basket which will help stop larger particles entering and clogging the pump. This extends the life of your pump and saves you the time and hassle of maintenance. With the exception of the smallest 440 model, each Oase Aquarius Universal pump can be set-up outside of the water, or below water level, both the indoor and the outdoor version, allowing you the options of running the pump dry, should your situation require it, the 440 model, however, must be fully submerged. Thanks to this robust stainless steel filter basket, coarse debris particles up to 4 mm in size are displaced with no problems. Easy mechanical adjustment via the flow regulator of the Aquarius Universal Eco 3000 / Eco 4000 and 4000 - 12000. Simultaneously dry set-up is also possible. 3 Year Guarantee, plus 2 additional years on registration. Oase Aquarius Fountain set pumps are very reliable, simply to and compact. They are easy to install in water features with versatile effects. The highly acclaimed F.I.S. principal ensures great performance, low running cost and unrivalled reliability. Oase Aquarius Fountain set pumps are supplied with fountain nozzle and tee piece for simultaneous operation of fountain and waterfall or filtration.The Oase Aquarius Fountain Set Pumps are a n Easy-to-install in water fountain pump features with versatile effects. Second adjustable outlet (½" to 1"). Second adjustable outlet (½" to 1"). Including 3 nozzle patterns. Individual alignment of the fountain via the telescopic extension and 15° swivel head. Feet guarantee stable setup on the pond floor. Complete range equipped with thermal cut-off device. For many years at OASE, the name Aquarius Fountain has stood for quality, power, and reliability, made in Germany.Oase Aquarius Fountain Set Pumps are developed using the very latest technology in fountain pumps, with patent pending unique selling points and unparalled periods between maintenance. One of the most significant differentiating characteristics relative to the previous Aquarius Fountain generation are the filter wings attached to the side that have the benefit that the pump gains over-proportional filter surface. The attached filter wings can be removed from the pump and can be used in the shallow area of the pond via a supplied special adapter. This means that the pre-filter can be conveniently maintained from the edge of the pond. The height of the fountain can be comfortably adjusted from the edge of the pond, too. The Oase Aquamax Eco Pump (Pride of the Oase Range) has been developed with the intention to transport a maximum of polluted water into a filter system by using as little pressure as possible. The main difference between the Oase Aquamax Eco Pumps and the other pumps is its particularly specially designed impeller. With the Oase Aquamax Eco Pump due to the two large blades of the impeller, even highly polluted water can be transported efficiently (this means the fish and other waste). Oase have now come up with a new range of pumps to extend the Oase Aquamax Pump range. Unlike the previous models, the new Oase Aquamax Eco Pump range has a capability of using a 'Satellite' suction cage in addition to its own substantial case - this means that you can pull in dirty water and other debris from two areas of the pond at the same time. During the seasonal rhythm ponds undergo regular changes and experience many influences. They are ecological systems that want to be continuously balanced. The new intelligent generation of the Oase Aquamax Eco Pump is now meeting these individual requirements. Thanks to the newly developed function “Seasonal Flow Control” (SFC) these filter and water course pumps adapt all year-round to the respective pond ecology and support the bio-system by enabling temperature-dependent water circulation. According to the temperature level of the water they constantly transport the required water quantity which is appropriate for ideal filtration. Therefore, these Oase Aquamax Eco Pumps are optimally and energy- efficiently used throughout each season. In terms of economy the whole product range of the Oase Aquamax Eco pump achieves energy savings of up to 40%. Due to the additional SFC-function (for Oase Aquamax Eco 12000/16000) additional savings of up to 20% are possible. This allows you total energy savings of up to 60%!